Below are some performance numbers for Miles 10. The graphs below are for fairly basic usage - adding sends, more complicated filters, or buses can (and will) affect results. All tests are done with threading disabled, rendering the audio to a 7.1 channel memory buffer. Each color represents the 40 voices being played with different effects, in order to see the cost of adding them to a voice. Both PCM and compressed sources are shown with each effect. 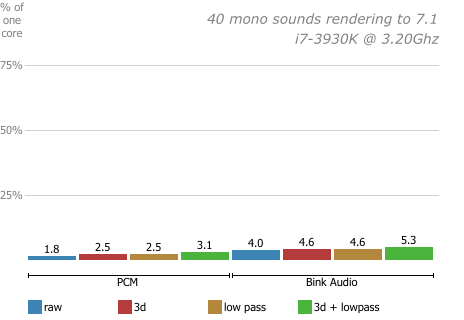 The compression used is Bink Audio, shown on the right half of the image. 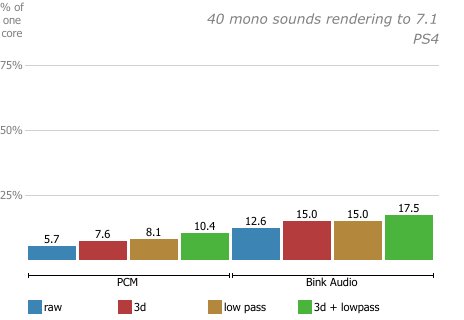 This is the same graph, except using 5.1 audio sources. Channel count scales fairly linearly. The PS4 processor is slower than modern PCs, but Miles is so fast that it hardly matters. Love these numbers? Email us to get an evaluation SDK!